20 November - After a bright and sunny day yesterday, it rained for much of last night. This morning it is (just about) fine, and 11C outside at 10.15am. - I have just had a walk down the garden and was buzzed by a large bumble bee! Yesterday was spent doing things away from the garden, and it was not until we came home just before 8pm, after a meal with one of our sons that I was greeted by this insect on the table on our veranda. It is an Ichneumon fly, probably a Pimpla species, and very similar to P. instigator, a very common ectoparasite of certain moth larvae. When you click on the picture you will see a series of four large images of it. It's a little bit surprising to see this active here now - I would expect to find these during the summer months. Ichneumon flies like this one use their antennae to transmit vibrations as they scan for hosts, receiving the reflected signals through sensors in their legs. 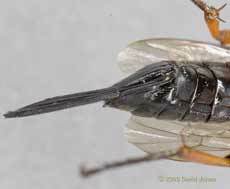 This picture, taken through glass, shows the ovipositor from below. 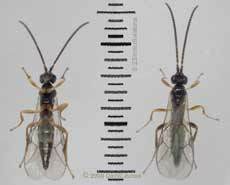 When you look at the insect from above, what you see extending from the tail is a rather stout structure made up of two halves. This protects the slender ovipositor which is visible in the photograph, which shows how it actually starts a short way before the end of the abdomen (at the lowest point when you look at the insect from the side). 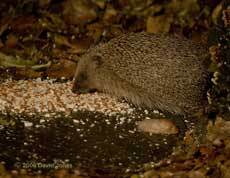 During the mild spell just gone, I didn't see any hedgehogs in the garden in the late evening, but there has been one here over the last couple of nights, tucking into the chopped peanuts that I leave out. 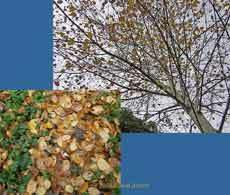 The birch is starting to look bare, with more leaves on the ground than on the tree, and the Rowan has only a couple left on it. 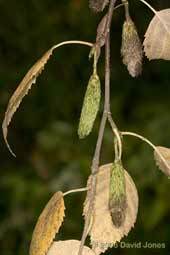 the tree is already preparing for next Spring, with well developed buds along the branches, and flower-heads at the branch tips. At the other end of the garden there is also a sign of what to expect in the Spring as the Three-cornered Garlic (also called Three-cornered Leek) has started sending its slender green leaves up above the cover of the fallen Hawthorn foliage! Another observation that I would normally associate with Spring or Summer is the appearance of eggs on plants. 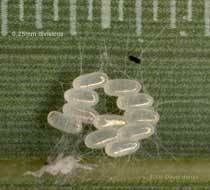 There are several groups of these eggs on the Bamboo plant by my workshop shed, each laid close to the central spine of a leaf. The presence of the silk threads around them suggests that they could have been laid by a Barkfly, although I'm not sure if they are too big. This second group was also laid on the spine of a leaf, but the insect responsible seems to have chosen to lay them on a 'blanket'!! While I was checking the bamboo I found a very small Ichneumon fly which seemed to be the 'right size' to be a parasite of the aphids. Unfortunately it escaped before I could photograph it. 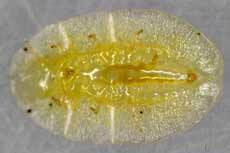 Instead, I collected this tiny Springtail, measuring some 1.5mm in length from the same leaf. Although I cannot identify the species, superficially it resembles Entomobrya nivalis, a larger species with similar markings. 21 November - A bright and breezy morning was somewhat marred when one of the Goldfinches flew into our patio window and died. It's very sad to hold such a beautiful little bird in your hand and know that there is nothing you can do for it. I have buried it under the Hawthorn. We very rarely get bird strikes despite the large numbers that feed here, although a Starling did knock itself out a few days ago - it recovered within a few minutes without any ill-effects. As a precaution against a repeat I've printed out a couple of bird shapes and attached them to the window. On a more positive note, when I opened the curtains this morning the first bird I saw was a Wren just beyond the veranda. As a follow-up to yesterday's eggs, here is a picture that hopefully confirms their identity. 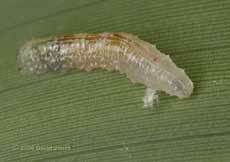 This Barkfly (on another bamboo leaf) was either still in the process of egg-laying, or was attaching the silk strands around them. I'll check again later to see if there have been any additions to the clutch. 24 November - It has been a dull and sometimes wet day with no breaks in the cloud at all. we are expecting strong winds tonight so I've been securing things around the garden, just in case the forecasters are correct this time. The hide on the scaffold tower had to be tied down, and I needed to replace one of the ropes that use as an extra precaution over the roof of the caravan shelter. The old rope was of natural fibre and has rotted away, and I've replaced it with a synthetic fibre rope. Beyond doing that essential work I'm afraid that the last few days have been close to cancelled(! ), with no photography, and very little else - hence the gap in the diary. On a more positive note, I have managed to organise the grids for next year's calendar ( a job that I could do in bits, when I felt awake enough!). I hope to get the photographs sorted out and the pages completed by the end of the month. The bird strikes continue, with a Collared Dove the day before yesterday, and then a Blackbird Yesterday. Neither bird suffered more than a bit of a shock and flew off soon afterwards. I'm increasingly sure that it has to be blamed on the attentions of the Sparrowhawk. It came again today while I was outside. When is saw me it retired to one of the tall conifers, but as soon as it thought that I had disappeared behind the caravan it swooped again. The hedgehogs continue to visit each night. Although I only ever see one of two at a time, the varied sizes suggest that there are at least three that visit, with the earliest sighting so far being around 6pm - the crushed peanuts I put out disappear every night, with most of it going after I have retired for the night. 26 November - The strong winds forecast for yesterday failed to materialise but we did get some heavy rain. More fell in the early hours of this morning, and along with a couple of heavy showers later in the morning it left the path down the garden under an inch of water for several hours. As the water subsided I used sand to raise the level of the stepping stones, and as I did there was a surprise when I spotted this small toad swimming in the standing water. Measuring just over an inch in length, this is the only toad that I have seen in the garden all year, and was a very welcome sight. I also spent a few minutes using a leaf rake to clear some of the rotting plant material from the small pond, just shifting the debris to just beyond the far end of the pond, where young Iris leaves are already showing. In my last entry I mentioned the hedgehogs. This is the (a) larger visitor, photographed by tungsten lighting at around 10pm last night. It seems that this one regularly enters the garden under the gate, whereas at least one of the smaller ones arrives under the garden fence right next to the veranda. As I write this at 10.30pm, one of the smaller hedgehogs is busy feeding in the same spot. 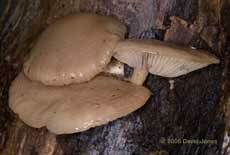 Back on 10 October I photographed a Wrinkled Peach fungus (Rhodotus palmatus) on a log at the bottom of the garden. The fruiting bodies are still there, but are now starting to droop. I'm relieved to say that there have been no more bird strikes over the last two days, although the weather has reduced bird activities somewhat. 27 November - A very mild day with just a few drops of rain this morning. At 9.30pm it is still 12C outside, having reached 13C during the day. Last night it didn't drop below 10C - great for the central heating bills! 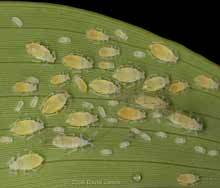 The mild conditions also suit the aphids that continue to thrive on the bamboo plants, at least, on the lower leaves - I think the Sparrows help to keep the higher foliage clear. 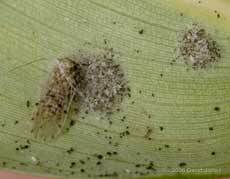 Groups like this one are to be found on the undersides of leaves. Their honeydew, which drips down to the upper surfaces of other leaves attracts the occasional insects, mainly ants. 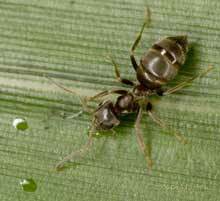 I do not see any ants actually visiting the aphid groups. 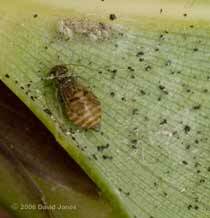 The aphids' presence also provides a continuing food source for several predatory hoverfly larvae. This one was about 6mm long. I keep on hoping to spot an ichneumon fly taking an interest on the aphids, but so far I've been out of luck, although I occasionally come across a possible candidate elsewhere on the bamboo. This one turned up today. While it is similar in size and colouration to an Ichneumon fly that I photographed on the 14th, this individual lacks the tapered 'waist' and long ovipositor of that previous fly. If you click on the picture, as well as the enlarged version of this image, you will see several closer views of it. 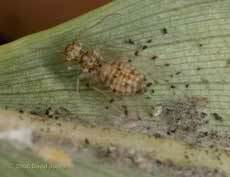 On the 21st I included a photograph of a Barkfly with eggs. 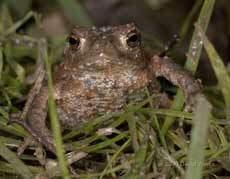 Interestingly, I could not see any of this species today, despite a thorough search of the bamboos. However, there are still numerous examples of this smaller type on the bamboo. 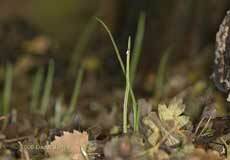 They are nearly always found at the base of the leaves, where the frond is still partly curled. 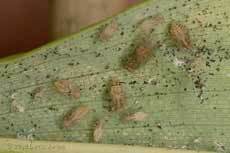 When you turn the leaf over, their presence is betrayed by the black specks of their frass (droppings) which are often sticking to the web of silk threads produced by the insects. More often than not, I usually find a single insect that appears to be minding eggs. You can see one egg in the first picture, and in this, it seems that they are hidden under silk, decorated with frass. 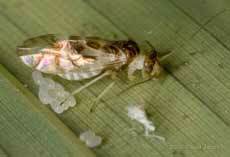 In this case, while you can see the eggs in the background, the Barkfly has only partially developed wings. 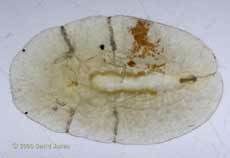 There were no others on that leaf - is this the parent, or a nymph at an advanced stage in its development, its presence just a coincidence? 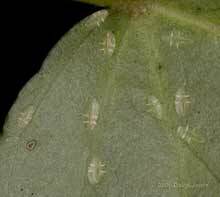 While it was usual to see just one or two barkflies on any particular leaf, this group proved the exception, with nymphs at different stages of development. 28 November - A dry, rather dull day after another mild night, with the temperature only dropping to around 11C at 8am. It remained at this level for most of the day before dropping a bit this evening so that it is now 8C at 9pm. I spent a while checking out the lower parts of the Ivy this afternoon. There was very little obvious activity to be seen, with only a few aphids and Barkflies to be found. However, there were numerous of these almost ghostly looking shapes on the undersides of the leaves. Almost flat, and just 2mm long, they are scale insects, possibly Pulvinaria floccifera (Cushion Scale). I think these are nymphs which are over-wintering. 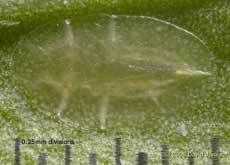 They are almost transluscent, and very little body detail shows up against the texture of the leaf. Look carefully to the left of the large version of this image (the front end) and you may just about make out two small dark red patches at the 'rim' - these are its eyes. This is another one that I lifted off the leaf. The eyes are clearer in this image, and while the insects do not move about, you may just be able to see three pairs of legs. I may take further images to see if I can show them, and other details more clearly. 29 November - A brighter day with a high of 12C after a colder start (<5C at 8am). I was only able to achieve a little bit today. 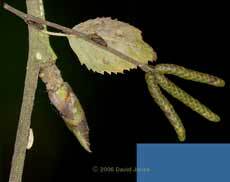 I did make a start with the aim of improving on yesterday's images of the scale insect but I soon 'ran out of steam' and had to stop. Before that happened I did manage a couple of pictures which are worth keeping. This first one shows quite clearly the six legs of the insect, and they were in constant movement as I photographed it. You can also see one of its antennae towards the top left of the image (just behind one of its eyes). The second image is of the same individual, photographed this time between crossed polarising filters. As they are more difficult to see in this image, I have used arrows to indicate the three legs on one side.